Colonel J F Preston, 75th Virginia Militia (Montgomery County), was appointed colonel, Provisional Army of Virginia, at Manassas Junction, Prince William County, Virginia, on 25 April, 1861. Colonel L T Moore, 31st Virginia Militia (Frederick County), was ordered to Harpers Ferry, Jefferson County, Virginia, on 18 April, 1861, and was appointed lieutenant colonel, Provisional Army of Virginia, on 17 May, 1861 (See the Virginia Militia). Captain J F Kent, Wythe Greys, was appointed major, Provisional Army of Virginia, at Harpers Ferry, Jefferson County, Virginia, on 4 May, 1861. The company was accepted in state service at Wytheville, Wythe County, Virginia, under the command of Captain J F Kent, on 17 April, 1861, and was ordered to proceed by the Virginia & Tennessee Railroad to Richmond, Henrico County, Virginia, on 21 April, 1861. The company arrived at Christiansburg Station, on the Virginia & Tennessee Railroad, one mile north of Christiansburg, Montgomery County, Virginia, at 5 PM on 23 April, 1861, and by the Richmond & Danville Railroad at Richmond via Lynchburg, Campbell County, Virginia, on 24 April, 1861. The company was mustered in state service for one year by Colonel J B Baldwin, Provisional Army of Virginia, the same day. Captain J F Kent, 4th Virginia Infantry, Company A, was appointed major, 4th Virginia Infantry, at Richmond, Henrico County, Virginia, on 4 May, 1861, and First Lieutenant W Terry, 4th Virginia Infantry, Company A, was appointed captain, 4th Virginia Infantry, Company A, on 14 May, 1861. The company was ordered to proceed by the Virginia Central Railroad to Harpers Ferry, Jefferson County, Virginia, on 10 May, 1861, and arrived by the Winchester & Potomac Railroad via Strasburg, Shenandoah County, and Winchester, Frederick County, Virginia, on 12 May, 1861. The company was on detached service as artillery between 28 February and 29 March, 1862, and was assigned to the 4th Virginia Infantry on 10 April, 1862. The company was accepted in state service at Big Spring, Montgomery County, Virginia, on 18 April, 1861, and was mustered in state service for one year at Richmond, Henrico County, Virginia, by Colonel J B Baldwin, Provisional Army of Virginia, on 25 April, 1861. Captain D Edmundson, 4th Virginia Infantry, Company B, suffered a severe arm fracture at the first battle of Manassas on 21 July, 1861, and was stationed at Charlottesville, Albemarle County,, Virginia, on 22 July, 1861. The company was accepted in state service at Newbern, Pulaski County, Virginia, under the command of Captain J A Walker, on 17 April, 1861, and was ordered to Richmond, Henrico County, Virginia, on 21 April, 1861. The company arrived by the Virginia & Tennessee Railroad at Christiansburg Station, on the Virginia & Tennessee Railroad, one mile north of Christiansburg, Montgomery County, Virginia, at 5 PM on 23 April, 1861, and was ordered to Richmond, Henrico County, Virginia, at 9.30 PM on 24 April, 1861. The company arrived by the Richmond & Danville Railroad at Richmond via Lynchburg, Campbell County, Virginia, at 2 PM on 25 April, 1861, and was mustered in state service for one year at the old City Hall, between Broad and Capitol Streets and Tenth and Eleventh Streets, Richmond, Henrico County, Virginia, by Colonel J B Baldwin, Provisional Army of Virginia, the same day. Captain J A Walker, 4th Virginia Infantry, Company C, was appointed lieutenant colonel, 13th Virginia Infantry, on 1 May, 1861, and First Lieutenant R D Gardner, 4th Virginia Infantry, Company C, was appointed captain, 4th Virginia Infantry, Company C, on 25 July, 1861 (See the 13th Virginia Infantry). The company was accepted in state service at Marion, Smyth County, Virginia, on 18 April, 1861, and was ordered to Richmond, Henrico County, Virginia, on 21 April, 1861. The company arrived by the Virginia & Tennessee Railroad at Christiansburg Station, on the Virginia & Tennessee Railroad, one mile north of Christiansburg, Montgomery County, Virginia, at 5 PM on 23 April, 1861, and was ordered to Richmond, Henrico County, Virginia, the same day. The company arrived by the Richmond & Danville Railroad at Richmond via Lynchburg, Campbell County, Virginia, on 24 April, 1861, and was mustered in state service for one year by Colonel J B Baldwin, Provisional Army of Virginia, the same day. The company was accepted in state service at Blacksburg, Montgomery County, Virginia, on 18 April, 1861, and was ordered to Richmond, Henrico County, Virginia, on 22 April, 1861. The company arrived at Christiansburg, Montgomery County, Virginia, on 23 April, 1861, and was ordered to proceed by the Virginia & Tennessee Railroad to Richmond, Henrico County, Virginia, the at 9.30 PM on 24 April, 1861. The company arrived by the Richmond & Danville Railroad at Richmond via Lynchburg, Campbell County, Virginia, at 2 PM on 25 April, 1861, and was mustered in state service for one year by Colonel J B Baldwin, Provisional Army of Virginia, on 26 April, 1861. The company was ordered to proceed by the Virginia Central Railroad to Harpers Ferry, Jefferson County, Virginia, on 10 May, 1861. The company was accepted in state service at Elk Creek, Grayson County, Virginia, on 24 April, 1861, and arrived by the Richmond & Danville Railroad at Richmond via Wytheville, Wythe County, Virginia, at 1 PM on 2 May, 1861. The company was mustered in state service for one year at Richmond, Henrico County, Virginia, by Colonel J B Baldwin, Provisional Army of Virginia, on 4 May, 1861, and was ordered to proceed by the Virginia Central Railroad to Harpers Ferry, Jefferson County, Virginia, on 13 May, 1861. The company arrived by the Winchester & Potomac Railroad at Harpers Ferry, Jefferson County, Virginia, on 15 May, 1861. Captain P N Hale, 4th Virginia Infantry, Company F, was killed at the first battle of Manassas on 21 July, 1861. The company was accepted in state service at Christiansburg, Montgomery County, Virginia, on 17 April, 1861, and was ordered to Richmond, Henrico County, Virginia, at 9.30 PM on 24 April, 1861. The company arrived by the Richmond & Danville Railroad at Richmond via Lynchburg, Campbell County, Virginia, at 2 PM on 25 April, 1861, and was mustered in state service for one year by Colonel J B Baldwin, Provisional Army of Virginia, the same day. The company was stationed at Maryland Heights, opposite Harpers Ferry, Jefferson County, Virginia, on 22 May, 1861, and Captain R C Trigg, 4th Virginia Infantry, Company G, was appointed colonel, 54th Virginia Infantry, on 4 September, 1861. The company was accepted in state service at Lexington, Rockbridge County, Virginia, on 20 April, 1861, and was ordered to the Virginia Military Institute, Lexington, Rockbridge County, Virginia, on 22 April, 1861. The company was ordered to proceed by stagecoaches to Staunton, Augusta County, Virginia, on 14 May 1861, and was mustered in state service for one year by Major & Quartermaster W H Harman, Provisional Army of Virginia, on 15 May, 1861. The company was ordered to proceed by the Virginia Central Railroad to Harpers Ferry, Jefferson County, Virginia, on 16 May, 1861, and arrived by the Winchester & Potomac Railroad on 17 May, 1861. 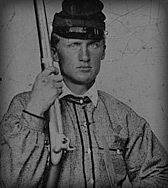 Drillmaster J S Moffett, Virginia Military Institute, was appointed acting captain, 4th Virginia Infantry, Company H, on 21 July, 1861 (See the 1st Rockbridge Artillery). The company was accepted in state service with seventy-three students of Washington College, on Woods Creek, north of Lexington, Rockbridge County, Virginia, on 2 June, 1861, and was ordered by stagecoaches to Staunton, Augusta County, Virginia, on 8 June, 1861. The company arrived at the Virginia Central Railroad Station, on Middlebrook Avenue, Staunton, Augusta County, Virginia, at 10 PM on 9 June, 1861, and was mustered in state service for one year by Major & Quartermaster W H Harman, Provisional Army of Virginia, on 10 June, 1861. The company was ordered to proceed by the Virginia Central Railroad to Harpers Ferry, Jefferson County, Virginia, on 12 June, 1861, and arrived by the Valley Turnpike at Winchester, Frederick County, Virginia, in the evening on 14 June, 1861. The company was assigned to the 4th Virginia Infantry, Company I, at Camp Johnston, Shenandoah Valley Agricultural Society Fairgrounds, one mile northwest of Winchester, Frederick County, Virginia, on 18 June, 1861. The company was accepted in state service at Lexington, Rockbridge County, Virginia, on 18 April, 1861, and was ordered to Harpers Ferry, Jefferson County, Virginia, at 1 PM the same day. The company arrived at Harpers Ferry, Jefferson County, Virginia, on 23 April, 1861, and was assigned to the 5th Virginia Infantry, Company B, on 8 May, 1861 (See the 5th Virginia Infantry). The company was mustered in state service for one year by Captain M McDonald, Provisional Army of Virginia, on 15 May, 1861, and was assigned to the 4th Virginia Infantry, Company K, at Camp Johnston, Shenandoah Valley Agricultural Society Fairgrounds, one mile northwest of Winchester, Frederick County, Virginia, on 13 July, 1861. The company was assigned to the 27th Virginia Infantry, Company K (2nd), at the rear between Blackburn's and Mitchell's Fords, on the Bull Run River, on 24 July, 1861 (See the 27th Virginia Infantry). The company was accepted in state service at Blacksburg, Montgomery County, Virginia, on 16 July, 1861, and was ordered to Richmond, Henrico County, Virginia, the same day. The company arrived Christiansburg, Montgomery County, Virginia, on 16 July, 1861, and was ordered to Lynchburg, Campbell County, Virginia, on 17 July, 1861. The company arrived at Lynchburg, Campbell County, Virginia, the same day and was ordered to proceed by the Southside Railroad to Richmond, Henrico County, Virginia, on 21 July, 1861. The company arrived by the Richmond & Danville Railroad at Richmond, Henrico County, Virginia, the same day and was ordered to proceed by the Virginia Central Railroad to Manassas Junction, Prince William County, Virginia, by Special Orders No.229, Paragraph VII, Headquarters, Virginia Forces, Richmond, Henrico County, Virginia, on 27 July, 1861, dated 23 July, 1861, and arrived by the Orange & Alexandria Railroad at Camp Pickens, Manassas Junction, Prince William County, Virginia, on 28 July, 1861. The company arrived at Camp Harman, one mile east of Centreville, Fairfax County, Virginia, on 2 August, 1861. "By order of Gen. Harman, the Rockbridge Rifles (Capt. Letcher) left today at 1 o'clock for Staunton. They number near 100 able-bodied men. This evening the Rockbridge Troop, (Capt. White,) 80 strong, leave for Staunton, and the Troop in the lower end of our county, (Capt. McNutt,) goes with them." "The following military companies from Southwestern Virginia arrived in Richmond yesterday, by the Danville cars viz: Smythe Blues, Albert G. Pendleton, Esq., Captain - 72 strong. Wyth. Grays, Jos. F. Kent, Captain - 76 strong; and Charlotte Rifles, Thos. J. Spencer, Captain - 73 strong." "The following volunteer companies arrived in Richmond yesterday, about 2 o'clock, via the Danville Railroad: Wise Fencibles, Montgomery county, Capt. R. C. Trigg, 83 men; Company A, Pittsylvania county, 101st Regiment, Capt. Wm. H. Werth, 84 men; Pulaski Guard, Capt. Jas. A. Walker, 83 men; Prospect Grays, Prince Edward county, 63 men, Capt. E. G. Wall, and Farmville Guards, Capt. R. A. Booker, 96 men." "This fine looking company, under command of Capt. T. N. Hale, arrived here by the Danville train at 1 o'clock yesterday afternoon. They number eighty-five; but their ranks will be filled in the course of a day or two, the remainder being now on their way. They will doubtless be mustered into service to-day, when they will receive their arms." "Yesterday and to day our camp has been abundantly excited. Two thousand troops have arrived, the majority of them from Alabama, with a detachment of Cherokee Indian warriors from North Carolina, and a body of Virginia riflemen, who glory in the name of Grayson Dare Devils." "The Libert Hall Volunteers, a company composed of the students of Washington College, left here on Saturday last. Suffice it to say that they are a noble set of fellows, possessed of that high moral courage so charcteristic of our well-educated youth." A guide to Virginia military organisations 1861-1865, Revised Second Edition by I A Wallace, Jr.
"Some of the camp Lee cadets also came to Harper's Ferry to help out; among them was John Stuart Moffett, who was assigned to train the 4th Virginia Infantry." "In its ranks as acting volunteer captains were Cadets Norris, Hempstead, Wight, and Moffett." The 4th Virginia Infantry, Companies A, B, C, D, E, F, and G, were stationed at Camp of Instruction or Lee, Hermitage Agricultural Fairgrounds, between the Richmond, Fredericksburg & Potomac Railroad and Deep Run Turnpike, two miles northwest of the Capitol, Captiol Hill, Richmond, Henrico County, Virginia, on 30 April, 1861, and were assigned to Colonel J F Preston, Provisional Army of Virginia, by Special Orders No.32, Headquarters, Virginia Forces, Richmond, Henrico County, Virginia, on 9 May, 1861. Note: The Wythe Greys (73), the Pulaski Guards (84), the Smyth Blues ((72), the Montgomery Highlanders (76), and the Montgomery or Wise Fencibles (85) were stationed at Richmond, Henrico County, Virginia, on 27 April, 1861. Mustered for one year, Richmond, Henrico County, Virginia, Companies A, B, C, D, E, F, & G, 24, 25, & 26 April & 4 May, 1861: The 4th Virginia Infantry, Companies A and D, were mustered in state service for one year at Richmond, Henrico County, Virginia, by Colonel J B Baldwin, Provisional Army of Virginia, on 24 April, 1861; Companies B, C, and G for one year on 25 April, 1861; Company E for one year on 26 April, 1861; and Company F for one year on 4 May, 1861. Mustered for one year, Harpers Ferry, Jefferson County, Virginia, 15 May, 1861: The 4th Virginia Infantry, CompanK (1st), was mustered in state service for one year at Harpers Ferry, Jefferson County, Virginia, by Captain M McDonald, Provisional Army of Virginia, on 15 May, 1861. Mustered for one year, Staunton, Augusta County, Virginia, Companies H & I, 15 May & 10 June, 1861: The 4th Virginia Infantry, Companies H and I, were mustered in state service Company H for one year at Staunton, Augusta County, Virginia, by Major & Quartermaster W H Harman, Provisional Army of Virginia, on 15 May, 1861, and Company I for one year on 10 June, 1861. Wytheville, Wythe County; Newbern, Pulaski County; & Marion, Smyth County, to Christiansburg Station, on the Virginia & Tennessee Railroad, one mile north of Christiansburg, Mountgomery County, Virginia, Companies A, C, & D, 21-23 April, 1861: The Wythe Greys, the Pulaski Guards, and the Smyth Blues, were ordered to proceed by the Virginia & Tennessee Railroad to Richmond, Henrico County, Virginia, on 21 April, 1861, and arrived at Christiansburg Station, on the Virginia & Tennessee Railroad, one mile north of Christiansburg, Mountgomery County, Virginia, at 5 PM on 23 April, 1861. Note: The Montgomery Highlanders was stationed at Christiansburg Station, on the Virginia & Tennessee Railroad, one mile north of Christiansburg, Mountgomery County, Virginia, on 23 April, 1861, and the Pulaski Guards and the Montgomery Highlanders were ordered to Christiansburg, Mountgomery County, Virginia, at 9.30 PM on 23 April, 1861. Christiansburg Station, on the Virginia & Tennessee Railroad, one mile north of Christiansburg, Mountgomery County, to Richmond, Henrico County, Virginia, Companies A & D, 23-24 April, 1861: The Smyth Blues and the Wythe Greys were ordered to proceed by the Virginia & Tennessee Railroad to Richmond, Henrico County, Virginia, on 23 April, 1861, arrived by the Richmond & Danville Railroad via Lynchburg, Campbell County, Virginia, on 24 April, 1861. Christiansburg Station, on the Virginia & Tennessee Railroad, one mile north of Christiansburg, Mountgomery County, to Richmond, Henrico County, Virginia, Companies C, E, & G, 24-25 April, 1861: The Montgomery Highlanders, the Pulaski Guards, and the Wise Fencibles or Montgomery Invincibles were ordered to proceed by the Virginia & Tennessee Railroad to Richmond, Henrico County, Virginia, under the command of Colonel J F Preston, 75th Virginia Militia (Montgomery County), at 9.30 PM on 24 April, 1861, and arrived by the Richmond & Danville Railroad via Lynchburg, Campbell County, Virginia, at 2 PM on 25 April, 1861. Big Spring, Mountgomery County, to Richmond, Henrico County, Virginia, Company B, 24-25 April, 1861: The Fort Lewis Volunteers arrived by the Richmond & Danville Railroad at Richmond via Lynchburg, Campbell County, Virginia, between 24 and 25 April, 1861. Note: The Wythe Greys (73), the Smyth Blues (72), the Pulaski Guards (84), the Montgomery Highlanders (76), and the Wise Fencibles (85), were stationed at Richmond, Henrico County, Virginia, on 27 April, 1861. Elk Creek, Grayson County, to Richmond, Henrico County, Virginia, Company F, 2 & 8 May, 1861: The Virginia or Grayson Dare Devil s (100) arrived by the Richmond & Danville Railroad at Richmond via Lynchburg, Campbell County, Virginia, at 1 PM on 2 May, 1861, and was ordered to Ashland, Hanover County, Virginia, by Special Orders No.26, Headquarters of the Division, Richmond, Henrico County, Virginia, on 8 May, 1861. Camp of Instruction or Lee, Hermitage Agricultural Fairgrounds, between the Richmond, Fredericksburg & Potomac Railroad and Deep Run Turnpike, two miles northwest of the Capitol, Captiol Hill, Richmond, to Harpers Ferry, Jefferson County, Virginia, Companies A, B, C, D, E, & G, 10-12 May, 1861: The 4th Virginia Infantry (500), Companies A, B, C, D, E, and G, under the command of Colonel J F Preston, were ordered to proceed by the Virginia Central Railroad to Culpeper Courthouse, Culpeper County, Virginia, by Special Orders No.32, Headquarters, Virginia Forces, Richmond, Henrico County, Virginia, on 10 May, 1861, dated 9 May, 1861, and arrived by the Winchester & Potomac Railroad at Harpers Ferry, Jefferson County, via Manassas Junction, Prince William County; Strasburg, Shenandoah County; and Winchester, Frederick County, Virginia, in the evening on 12 May, 1861. Camp of Instruction or Lee, Hermitage Agricultural Fairgrounds, between the Richmond, Fredericksburg & Potomac Railroad and Deep Run Turnpike, two miles northwest of the Capitol, Captiol Hill, Richmond, to Harpers Ferry, Jefferson County, Virginia, Company F, 13-15 May, 1861: The Virginia or Grayson Dare Devils was ordered to proceed by the Virginia Central Railroad to Harpers Ferry, Jefferson County, Virginia, on 13 May, 1861, and arrived by the Winchester & Potomac Railroad via Manassas Junction, Prince William County; Strasburg, Shenandoah County; and Winchester, Frederick County, Virginia, on 15 May, 1861. Lexington, Rockbridge County, to Harpers Ferry, Jefferson County, Virginia, Company H, 14-17 May, 1861: The Rockbridge Greys arrived at Staunton, Augusta County, Virginia, on 14 May, 1861, and was ordered to proceed by the Virginia Central Railroad to Harpers Ferry, Jefferson County, Virginia, on 16 May, 1861. The company arrived by the Winchester & Potomac Railroad via Manassas Junction, Prince William County; Strasburg, Shenandoah County; and Winchester, Frederick County, Virginia, on 17 May, 1861. Note: The 4th Virginia Infantry, Companies B and D were assigned to detached service at Little Georgetown, on the Potomac River, Berkeley County, Virginia, between 27 May and 3 June, 1861. Harpers Ferry, Jefferson County, Virginia, 1 June, 1861: The 2nd Virginia Infantry, the 4th Virginia Infantry, the 5th Virginia Infantry, the 27th Virginia Infantry, and the 1st Rockbridge Artillery were assigned to Colonel T J Jackson, Provisional Army of Virginia, at Harpers Ferry, Jefferson County, Virginia, on 1 June, 1861. General Orders No.25, Headquarters, Virginia Forces, Richmond, Henrico County, Virginia, 8 June, 1861: The 4th Virginia Infantry was assigned to the Confederate States by General Orders No.25, Headquarters, Virginia Forces, Richmond, Henrico County, Virginia, on 8 June, 1861, and was accepted in Confederate service on 1 July, 1861. Evacuation Harpers Ferry, Jefferson County, Virginia, 15 June, 1861: The 4th Virginia Infantry evacuated Harpers Ferry, Jefferson County, Virginia, in the morning on 15 June, 1861, and was ordered to proceed by the Smithfield, Charlestown & Harpers Ferry Turnpike to Winchester, Frederick County, Virginia, the same day. The regiment arrived at Charlestown, Jefferson County, Virginia, in the afternoon on 15 June, 1861. Note: The 4th Virginia Infantry was stationed at Camp Johnston, on the Berryville & Charleston Turnpike, on the North or South Fork of Bull Skin Run, three or four miles west of Charlestown, Jefferson County, Virginia, in the evening on 15 June, 1861. Camp Johnston, on the Berryville & Charleston Turnpike, on the North or South Fork of Bull Skin Run, three or four miles west of Charlestown, Jefferson County, to Mill Creek, a quarter of a mile north of Bunker Hill, Berkeley County, Virginia, 16 June, 1861: The 4th Virginia Infantry was ordered to Bunker Hill, Berkeley County, Virginia, at 9 AM on 16 June, 1861, and arrived at Mill Creek, a quarter of a mile north of Bunker Hill, via Smithfield or Middleway, Berkeley County, Virginia, in the evening the same day. Note: The 4th Virginia Infantry was assigned to the First Brigade, Army of the Shenandoah, under the command of Brigadier General T J Jackson, Confederate States Army, at Mill Creek, a quarter of a mile north of Bunker Hill, via Smithfield or Middleway, Berkeley County, Virginia, on 16 June, 1861. Mill Creek, a quarter of a mile north of Bunker Hill, Berkeley County, to Stephenson's Station, on the Winchester & Potomac Railroad, four miles northeast of Frederick County, Virginia, 17 June, 1861: The 4th Virginia Infantry was ordered to proceed by the Martinsburg Turnpike to Winchester, Frederick County, Virginia, at 2 PM on 17 June, 1861, and arrived at Stephenson's Station, on the Winchester & Potomac Railroad, four miles northeast of Winchester, Frederick County, Virginia, in the evening the same day. Stephenson's Station, on the Winchester & Potomac Railroad, four miles northeast of Winchester, to the Shenandoah Valley Agricultural Society Fairgrounds, one mile northwest of Winchester, Frederick County, Virginia, 18 June, 1861: The 4th Virginia Infantry arrived at Camp Johnston, Shenandoah Valley Agricultural Society Fairgrounds, one mile northwest of Winchester, Frederick County, Virginia, in the evening on 18 June, 1861. Note: The Liberty Hall Volunteers arrived at Winchester, Frederick County, Virginia, in the evening on 14 June, 1861, and was assigned to the 4th Virginia Infantry, Company I, at Camp Johnston, Shenandoah Valley Agricultural Society Fairgrounds, one mile northwest of Winchester, Frederick County, Virginia, on 18 June, 1861. Camp Johnston, Shenandoah Valley Agricultural Society Fairgrounds, one mile northwest of Winchester, Frederick County, to Martinsburg, Berkeley County, Virginia, 19-20 June, 1861: The 4th Virginia Infantry was ordered to proceed by the Martinsburg Turnpike to Martinsburg, Berkeley County, Virginia, in the afternoon on 19 June, 1861, and arrived at Darkesville, Berkeley County, Virginia, at 11 PM same day. The regiment was ordered to Martinsburg, Berkeley County, Virginia, in the morning on 20 June, 1861. Note: The 4th Virginia Infantry was ordered to destroy the rolling stock of the Baltimore & Ohio Railroad at Martinsburg, Berkeley County, Virginia, on 20 June, 1861, and was stationed in the vicinity of Martinsburg, Berkeley County, Virginia, on 21 June, 1861. Martinsburg to Four Mile Woods or Four Mile Woods or Myer's Orchard, east of the Valley Turnpike, two & a half miles south of Hainesville, Berkeley County, Virginia, 21 June, 1861: The 4th Virginia Infantry was ordered to proceed by the Martinsburg & Williamsport Turnpike to Hainesville, Berkeley County, Virginia, at 3 PM on 21 June, 1861, and arrived at Camp Stephens, Four Mile Woods or Myer's Orchard, east of the Valley Turnpike, two and a half miles south of Hainesville, Berkeley County, Virginia, the same day. Skirmish between W Hills & W Port(a)erfield's Farms, west of the Martinsburg & Williamsport Turnpike, one & a half miles southwest of Falling Waters, Berkeley County, Virginia, 2 July, 1861: The 4th Virginia Infantry was ordered to support the 5th Virginia Infantry and the 1st Rockbridge Artillery on the Martinsburg & Williamsport Turnpike, in the vicinity of Hainesville, Berkeley County, Virginia, during the skirmish between W Hills and W Port(a)erfield's Farms, west of the Martinsburg & Williamsport Turnpike, one and a half miles southwest of Falling Waters Berkeley County, Virginia, at 9 AM on 2 July, 1861. Note: The 4th Virginia Infantry was assigned as support to one 6 pounder smoothbore and two 6 pounder light Cadet smoothbores between Hainesville and W Port(a)erfield's Farm, west of the Martinsburg & Williamsport Turnpike, one and a half miles southwest of Falling Waters, Berkeley County, Virginia, on 2 July, 1861. Camp Stephens, Four Mile Woods or Myer's Orchard, east of the Martinsburg & Williamsport Turnpike, two & a half miles south of Hainesville, to Darkesville, Berkeley County, Virginia, 2-3 July, 1861: The 4th Virginia Infantry arrived at Snodgrass or Big Spring, on the Martinsburg Turnpike, one and a half miles south of Martinsburg, Berkeley County, Virginia, in the evening on 2 July, 1861, and was ordered to Darkesville, Berkeley County, Virginia, in the morning on 3 July, 1861. Note: The 5th Virginia Infantry, Company B, was assigned to the 4th Virginia Infantry, Company K (1st), at Darkesville, Berkeley County, Virginia, on 3 July, 1861, and to the 27th Virginia Infantry, Company H (2nd), at the rear between Blackburn's and Mitchell's Fords, on the Bull Run River,on 24 July, 1861. Darkesville, Berkeley County, to Stephenson's Station, on the Winchester & Potomac Railroad, four miles northeast of Winchester, Frederick County, Virginia, 7-8 July, 1861: The 4th Virginia Infantry was ordered to Winchester, Frederick County, Virginia, at 9 AM on 7 July, 1861, and arrived at Camp Carter, Stephenson's Station, on the Winchester & Potomac Railroad, four miles northeast of Winchester, Frederick County, via Bunker Hill, Berkeley County, Virginia, in the afternoon on 8 July, 1861. Note: The 4th Virginia Infantry was stationed five miles north of Winchester, Frederick County, Virginia, in the evening on 7 July, 1861. Camp Carter, Stephenson's Station, on the Winchester & Potomac Railroad, four miles northeast of Winchester, to the Shenandoah Valley Agricultural Society Fairgrounds, one mile northwest of Winchester, Frederick County, Virginia, 10 July, 1861: The 4th Virginia Infantry was ordered to Winchester, Frederick County, Virginia, at 7 AM on 10 July, 1861, and arrived at Camp Johnston, Shenandoah Valley Agricultural Society Fairgrounds, one mile northwest of Winchester, Frederick County, Virginia, at 12 AM the same day. The 4th Virginia Infantry was ordered to Manassas Junction, Prince William County, Virginia, by Special Orders No.1, Headquarters, Army of the Shenandoah, Winchester, Frederick County, Virginia, at 1 AM on 18 July, 1861, dated 17 July, 1861. Camp Johnston, Shenandoah Valley Agricultural Society Fairgrounds, one mile northwest of Winchester, Frederick County, to Piedmont Station, Fauquier County, Virginia, 18-19 July, 1861: The 4th Virginia Infantry was ordered to proceed by the Millwood Turnpike to Piedmont Station, Fauquier County, Virginia, at 12 PM on 18 July, 1861, and arrived at Berry's Ferry, on the Shenandoah River, three and a half miles southeast of Millwood, Clarke County, Virginia, at 9 PM the same day. The regiment arrived at Paris, Fauquier County, Virginia, via Ashby's Gap at 1 AM on 19 July, 1861, and was ordered to Piedmont Station, Fauquier County, Virginia, at 3 AM same day. The 4th Virginia Infantry arrived at Piedmont Station, Fauquier County, Virginia, at 6 AM on 19 July, 1861. Piedmont Station, Fauquier County, to Manassas Junction, Prince William County, Virginia, 19 July, 1861: The 4th Virginia Infantry was ordered to proceed by the Manassas Gap Railroad to Manassas Junction, Prince William County, Virginia, at 9 AM on 19 July, 1861, and arrived at Camp Pickens, Manassas Junction, Prince William County, Virginia, at 4 PM the same day. Camp Pickens, Manassas Junction, Prince William County, to Blackburn's & Mitchell's Fords, on the Bull Run River,19 & 20 July, 1861: The 4th Virginia Infantry was ordered to the Bull Run River in the evening on 19 July, 1861, and to the rear between Blackburn's and Mitchell's Fords, on the Bull Run River, in the morning on 20 July, 1861. Note: The 4th Virginia Infantry was stationed at the rear between Blackburn's and Mitchell's Fords, on the Bull Run River, as support to the First Brigade, Army of the Potomac, on 21 July, 1861. After the first battle of Manassas the 4th Virginia Infantry was ordered to the rear between Blackburn's and Mitchell's Fords, on the Bull Run River, in the evening on 21 July, 1861. Rear between Blackburn's & Mitchell's Fords, on the Bull Run River, to Flat Run, three miles northwest of Manassas Junction, Prince William County, Virginia, 27 July, 1861: The 4th Virginia Infantry arrived at Camp Maggot, on Flat Run, three miles northwest of Manassas Junction, Prince William County, Virginia, on 27 July, 1861. Blacksburg, Montgomery County, Virginia, to one mile east of Centreville, Fairfax County, Virginia, Company K (2nd), 16 July-2 August, 1861: The 4th Virginia Infantry, Company K (2nd), was ordered to Richmond, Henrico County, Virginia, on 16 July, 1861, and arrived by the Orange & Alexandria Railroad at Camp Pickens, Manassas Junction, Prince William County, via Lynchburg and Richmond, Henrico County, Virginia, on 28 July, 1861. The company was ordered one mile east of Centreville, Fairfax County, Virginia, on 2 August, 1861. Camp Maggott, on Flat Run, three miles northwest of Manassas Junction, Prince William County, to Centreville, Fairfax County, Virginia, 2 August, 1861: The 4th Virginia Infantry arrived at Camp Harman, one mile east of Centreville, Fairfax County, Virginia, on 2 August, 1861. Note: The 4th Virginia Infantry was stationed at Camp Harman, one mile east of Centreville, Fairfax County, Virginia, on 31 August, 1861. Reorganised at Conrad's Store, on Elk Run Creek, Rockingham County, Virginia, 14, 15, 16, 20, 22, & 24 April, 1862: The 4th Virginia Infantry was reorganised at Conrad's Store, on Elk Run Creek, Rockingham County, Virginia, on 14, 15, 16, 20, 22, and 24 April, 1862. Surrendered at Appomattox Courthouse, Appomattox County, Virginia, 9 April, 1865: The 4th Virginia Infantry, under the command of Captain H D Wade, 4th Virginia Infantry, Company G, surrendered at Appomattox Courthouse, Appomattox County, Virginia, on 9 April, 1865. Brigadier General T J Jackson, Confederate States Army, First Brigade, Army of the Shenandoah: Major T J Jackson, Virginia Military Institute, was ordered to Richmond, Henrico County, Virginia, at 1 PM on 21 April, 1861, and arrived at Staunton, Augusta County, Virginia, at 4 AM on 22 April, 1861. He proceeded by the Virginia Central Railroad to Richmond, Henrico County, Virginia, at 9 AM the same day and arrived via Charlottesville, Albemarle County, and Gordonsville, Orange County, Virginia, at 3 AM on 23 April, 1861. Major T J Jackson, Virginia Military Institute, was appointed colonel, Provisional Army Virginia, and ordered to proceed by the Virginia Central Railroad to Harpers Ferry, Jefferson County, Virginia, on 27 April, 1861. Colonel T J Jackson, Provisional Army Virginia, was accompanied by Adjutant General J Preston and Inspector General J Massie, Confederate States Army, and arrived at Winchester, Frederick County, Virginia, on 28 April, 1861. He was ordered to proceed by the Winchester & Potomac Railroad to Harpers Ferry, Jefferson County, Virginia, at 2.30 PM on 29 April, 1861, and arrived in the evening the same day. Colonel T J Jackson, Provisional Army Virginia, was assigned to command the troops stationed in and around Harpers Ferry, Jefferson County, Virginia, by General Orders No.23, Division Headquarters, Harpers Ferry, Jefferson County, Virginia, on 30 April, 1861, and was appointed brigadier general, Confederate States Army, on 17 June, 1861, dated 8 July, 1861. Note: Brigadier General J E Johnston, Confederate States Army, arrived at Harpers Ferry, Jefferson County, Virginia, on 23 May, 1861. Provisional Army of Virginia, 23 April, 1861: The Provisional Army of Virginia was organised on 23 April, 1861, under a Virginia Ordnance dated 27 April, 1861. Second Corps, Army of the Potomac, 25 September, 1861: Major General G W Smith, Confederate States Army, was assigned to the command of the Second Corps, Army of the Potomac, by General Orders No.31, Headquarters, Army of the Potomac, Camp Pickens, Manassas Junction, Prince William County, Virginia, on 25 September, 1861. The 4th Virginia Infantry was assigned to the First Brigade, Second Corps, Army of the Shenandoah, under the command of Brigadier General T J Jackson, Confederate States Army, on 25 September, 1861. The above painting, 'Drive Them to Washington', is by Don Troiani, modern America's finest historical artist.